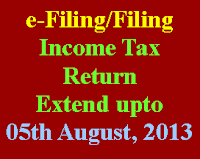 The Central Board of Direct Tax (CBDT), has extended the due-date' for filing Returns of Income from 31st July, 2013 to 5th August, 2013 for the Asstt. Year 2013-14. 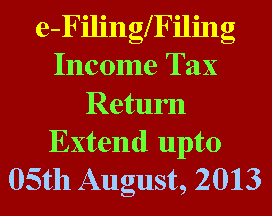 This is the unexpected relief of 5 days to the assessee / taxpayers as there is a huge rush for filing income tax return at Income tax department as it is mandatory to e-file your tax returns if your income is more than 5 lakh.. There is an unprecedented surge in number of returns being e-filed during this year. Approximately more than a crore returns have been filed/e-filed upto 31st July, 2013 which is almost 50% higher than the returns e-filed during the corresponding period of the last fiscal year. If the extension was not made, it would have been difficult for the tax payers to file income tax return who due to laziness or other reasons could not do so. However, no reason is given for extension but it has provided an opportunity to the tax payers to file their return if not already filed..